Yessss!! I love travelling and was so excited to make this prompt, since it includes some all time favourite reads - especially number 1! Again, the books are not in order and I'd love to hear what books you would add! Predictable, I know. This book doesn't just feature travelling, it's all about travelling. The whole story is one road trip after another and that's the reason I love this book so much. It's the 1960s, people are free to drive all around the country and everyone takes advantage of this - especially the Beat generation. Though marketed as a work of fiction, a reader soon figures out that this is Jack Kerouac's life and that just makes it so much better. Who else has ever had such a crazy life? Now I know the more expected book to put here is Lord of the Rings, but confession time: I haven't read that yet. So I'm settling for The Hobbit, which is also a kind of travelling book - just in a different realm. I loved exploring the world Tolkien made, but due to the fact that it really is a children's book, I missed some details. However, I'm sure that when I do read LOTR, which I really want to do, those details will be all there and push the whole saga up on my list. The first book on my list that isn't all about travelling. The trip in Paper Towns is very important, but it's all about the destination and not so much about the journey there. I loved it, because of the idea of a group of friends getting in a car and driving somewhere to find another friend. It's unplanned. It's crazy. And John Green wrote it, which means it was fascinating to read. At this point, I kinda got stuck at thinking of books featuring travelling, so I had help from Twitter friends and Goodreads to find these last two books. But honestly, I can't believe I FORGOT THIS BOOK. I used to be absolutely obsessed with The Sisterhood of the Travelling Pants. I was 12 or something when I read these books and I felt so mature to read about teenage girls with teenage problems - I fell in love. In these books, four girls share a pair of pants that they send all over the world during the summer so the pants is with all of them. Technically, most travelling is done by the pants, but there are some lovely romantic scenes in Greece that mean you will want to travel too. 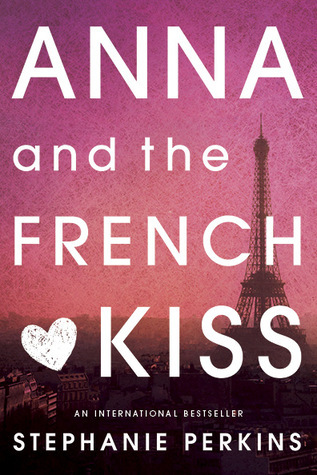 And I'm even more embarrassed that I had to see this book on a Goodreads travelling list before I thought of it: Anna and the French Kiss. I rave about this book in every post and somehow I forgot that Anna travels from America to Paris (this must justify a re-read, right?). I think almost everyone has read this book, so I won't talk about it too much, besides saying that if you haven't read it, read it. Please. Just do yourself that one favour.